America to Obama: Put a Mutt in the White House! Will the first dog be a stately Portuguese Water Dog, left, or a flashy Labradoodle? Or a good old American mutt from a pound? WASHINGTON — Mr. President-elect, the votes are in: American pet owners prefer a mutt in the White House. By more than a 2-1 margin, pet owners say the Obamas should choose a mutt for their first dog over a purebred, according to an Associated Press-Petside.com poll released Wednesday. People who don't have pets mostly don't care either way. "Let's get philosophical about it: We're kind of a country of mutts," said Steve Minor, 54, of Knightdale, N.C. "I think he'd set an example if he got a dog from a shelter that needed a home." 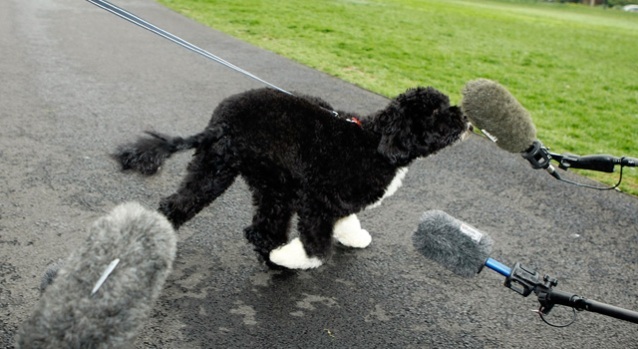 Obama said over the weekend that the family is choosing between two breeds: a Labradoodle (a cross between a poodle and a Labrador) and a Portuguese water dog, the kind owned by Sen. Edward Kennedy, D-Mass. Obama has indicated the family likes the idea of rescuing a shelter dog, but 10-year-old Malia is allergic and most shelter dogs are, as the president-elect put it, "mutts like me." Both the Labradoodle and the Portuguese water dog are low-shedding breeds. The survey, conducted by GfK, also found more than half of pet owners and 43 percent of all Americans said it was important to them that the Obamas adopt their dog from an animal shelter. Michelle Zabrucki, of Tampa, Fla., considers buying a purebred dog akin to wearing $200 jeans or carrying the latest designer bag. "The purebred dogs, it's become like a status symbol and it's ridiculous, especially with all the dogs they destroy every year," she said. "The strays are just as wonderful and just as loving and they don't cost $800 apiece." Pet owners showed a stronger preference for mutts than did all adults, 33 percent of whom said they'd prefer a mutt. Twenty-three percent of all adults preferred a purebred and 38 percent said it didn't matter. About six in 10 Americans own pets. Robert DeNoyelles of Cortes Lakes, Ariz., adopted two kittens himself and feels that a shelter is the way to go. "I feel strongly about adopting pets to prevent them from being killed and dying out here in the wilderness," said DeNoyelles, 63. "They're animals, they're almost like humans." The preference for a mutt cut across party lines, though Democrats feel more strongly about it than Republicans. Among all Democrats, 38 percent say the dog should be a mutt, compared with 32 percent of all Republicans. Republicans are more likely to say they don't care about the question, 42 percent, than Democrats, 33 percent. Past presidential pooches have included many purebreds, including incumbent Scottish terriers Barney and Miss Beazley. But Obama's hero, Abraham Lincoln, had a mixed-breed dog named Fido who didn't make the trip to the White House. Lyndon B. Johnson also had a mutt, Yuki, named for the Japanese word for snow. "Johnson's daughter Luci found the dog at a gas station in Texas on Thanksgiving Day in 1966. Yuki became Johnson's favorite pet," said Cathy Trost, exhibits chief at the Newseum, which has an exhibit on first dogs. Of course, purebreds have their backers, and not just because knowing the breed makes it easier to predict how the dogs will affect Malia's allergies. "If it was me, I would get a purebred. I think they're just better dogs," said Anthony Madrigal, 19, of Schererville, Ind. "I would love to get a Husky, but I can't afford it." But many Americans figure there are bigger issues for Obama to worry about. Pat Schoff, 55, of Baltimore, has a miniature pinscher herself but says different choices work for different people. "I guess in all reality, a dog's a dog," she said. Barbara Hamilton of Franklin, Ind., says she likes the idea of the Obamas taking in a shelter dog. But the lifelong Republican who voted for Obama says she would forgive him if he didn't. "Of all the decisions that he has to make, maybe it's better to let the girls make that decision," said Hamilton, 76.